The Iron Chevsky Wine Blog: Happy 4th of July with American wines! Happy 4th of July with American wines! 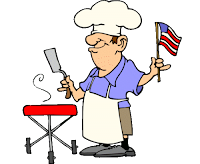 I stopped by the 4th of July backyard bbq party at Julie's. The Palo Alto local winos gathered en masse to give tribute to our founding fathers and to enjoy another gorgeous summer afternoon. A sort of a free for all, everyone brought wine, some brought food. Tom grilled a large whole rosemary-infused salmon, served with Dan's world's creamiest mashed potatoes, and a few fixins from various culinary wiz's. In this quintessential of all American holidays, what wine was I to bring but the quintessential American wine - a Zinfandel. And not just any Zin, a quintessential American Zin at a whopping 16.5% alcohol (yeeeehaaaaa) from Turley! There is a time and a place, ladies and gents. Dehlinger Pinot and a Mendocino County Syrah went super-nice with the 4th of July fare. Zins were excellent with carrot cake and blueberries fresh from Julie's 6ft-tall blueberry bushes. A really good 2002 Chambolle-Musigny red Burgundy was like a tuxedo-dressed English aristocrat at a a rowdy Texas rodeo. This one time a year, I blessed the good foresight of American founding fathers of wine to have started a revolution in the 60's and 70's so that today we could enjoy the fruits of our own country. Sweet and comforting, they tasted so right! I wanted to wish everyone a very happy 4th of July. This holiday is very meaningful to me, for I feel blessed to be living here. Especially for us hi-techies who wanted to leave a mark on the world, and could never realize our dreams in the old country. In no other place but the USA, could such a diverse multi-national group of talents as we have in the Silicon Valley come together and work side-by-side without prejudice. Thanks for the summary Gary. It's nice to know what I missed, as I couldn't both be there and at Christianne's gathering in Sunnyvale. Sounds like the food was wonderful. So where are the pics? Sorry Richard, no pics this time. The food disappeared in a flash too. All that's left is memories :)!